Like it or Love it? Or Not at all? "Aliens" does not always mean "Extraterrestrials"
Silk Scarf Brown Terracotta Olive Handmade Chiffon Shawl FOREST SONG, by Silk Scarves Colorado. Select Your SIZE! Birthday Gift, Christmas Gift, Anniversary Gift. Bridesmaid Gift, Valentine Gift. Gift-Wrapped. Elegant Handmade Silk Scarf. Hand Dyed Silk. Handmade in Colorado, USA. 100% silk. MADE TO ORDER silk scarf - the perfect gift! This is a 100% Chiffon silk scarf featuring diagonal brushstrokes in shades of brown, burgundy, golden terracotta, orange terracotta, taupe, olive green; decorated with metallic accents in bronze and metallic green. It is an elegant and chic chiffon silk scarf that makes a beautiful accessory to any outfit. PLEASE SELECT THE SIZE YOU ARE INTERESTED IN, while placing the order. These are original sizes - slight shrinkage occurs due to the steam-setting process that makes the silk scarf colorfast. The positioning/size/distribution of the design's components may vary for each size - in order to correspond to the scarf's size. - Size Medium: 11" x 60" (28 cm x 152 cm). - Size Large: 14" x 72" (35 cm x 183 cm). - Size Extra-Long: 11" x 90" (28 cm x 229 cm). - Luxurious Big: 22" x 90" (56 cm x 230 cm). - Large Square: 30" x 30" square (76 cm x 76 cm). - Extra-Large Square: 35" x 35" square (89 cm x 89 cm). NOTE: If you are interested in another size scarf - please send me a message, and I will be glad to create it for you! The scarf can also be personalized for the recipient (name, monogram, etc.) - if you are interested, please message me the details. The scarf is 100% silk, hemmed. The vibrant silk dyes are steam set for permanence, so each scarf is hand-washable. Each silk scarf in my shop is unique and a true piece of wearable art. It comes beautifully gift-wrapped, with an individual Care Instructions tag attached to each scarf. 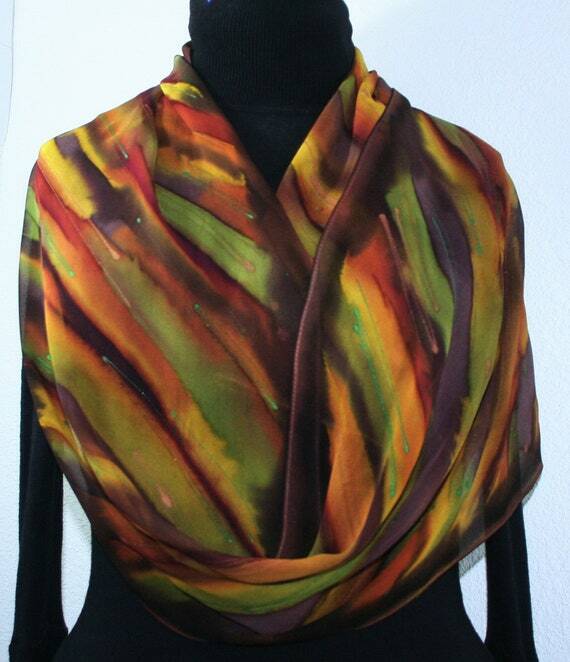 Silk scarves make sophisticated accessories for casual or business outfits, as well as perfect gifts. If the scarf is a gift, I can hand write your special message on a card to include in the gift wrapping. I never include an invoice in my packaging. Thank you for visiting Silk Scarves Colorado shop! This comment requires approval from the system administrator due to system setting. Once approved it will be visible for the public.